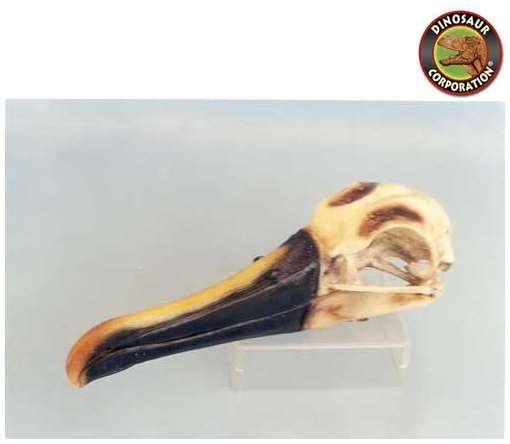 Indian Yellow-Nosed Albatross Skull. Thalassarche carteri. DIOMEDIAE. UC Santa Cruz specimen. The Indian Yellow-Nosed Albatross (Thalassarche carteri) is a member of the albatross family, and is the smallest of the mollymawks. In 2004, BirdLife International split this species from the Atlantic yellow-nosed albatross; however Clements has not split it yet, and the SACC has not either, but recognises the need for a proposal. The Indian Yellow-Nosed Albatross weighs 2.55 kg (5.6 lb), is 76 cm (30 in) long and is 2 m (6.6 ft) across the wings. The adult has a pale grey or white head and nape, with a dark grey mantle, upperwing, and tail. Its rump and underparts are white, and its underwing is white with a black tip with a narrow black margin at the leading edge. Its bill is black with a yellow upper ridge and a red tip.